Apple has been aggressively hyping that the iPhone X has the “most durable glass ever in a smartphone.” But the obvious, understandable worry here is whether a $1,000 phone made almost entirely of glass and stainless steel will immediately shatter when dropped. Upon its much-anticipated release, various tech blogs have been putting the state-of-the-art Tetris machine through the ringer, and what they’ve found isn’t exactly encouraging. It's important to note that durability tests run by tech sites aren't scientific per se, but they give some indication as to what you can expect when you inevitably drop yours (assuming you can afford one). In its video review, SquareTrade (and keep in mind that this company is an extended warranty supplier) went so far as to call the iPhone X "the most breakable, highest-priced, most expensive to repair iPhone ever." CNET found that the phone cracked on a first drop of three feet, aka pocket height. A second drop on the opposite side of the phone resulted in further damage. 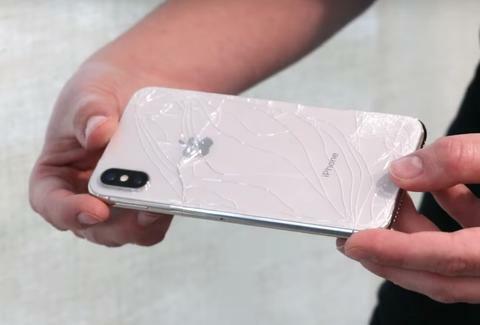 "The iPhone X can probably handle your everyday wear and tear, but dropping it without a case is out of the question," the site concluded. "We learned it only takes one bad drop to break the glass on this phone. Even the stainless steel frame is susceptible to damage." "The new iPhone is designed to be durable, but not indestructible, and goes through rigorous real world testing. iPhone X is made from the most durable glass ever in a smartphone with a 50 percent deeper strengthening layer using our dual ion-exchange process, further reinforced by an internal laser welded, steel and copper structure. And the surgical-grade stainless steel band that wraps around and reinforces iPhone X is a special Apple-designed alloy that is both durable and more pure. If anyone is concerned about dropping their iPhone and damaging it, we suggest using one of the many beautiful cases available to protect iPhone." This next video won't really supply any new information, but it might be edifying to see the cracks form in real time. Also it's really satisfying to watch someone break something this expensive, so enjoy. A Drop & the #iPhoneX Glass Smashes. This Video is part of the Drop Test. Some good news comes from this water test though. EverythingApplePro submerged the phone in 20 feet of water for a little over a half hour with no signs of liquid damage. The phone also remained functional after a tumble in the washing machine, which is impressive. The take away here is that you should 100% buy a case for this phone. Apple says it, the reviewers say it, your mother would probably tell you them same if you asked her. As we've already explained, you should also buy AppleCare+. This is an expensive phone already; no need to make it more expensive with repairs. James Chrisman is a News Writer at Thrillist who is also extremely breakable. Send news tips to news@thrillist.com and follow him on Twitter @james_chrisman2.